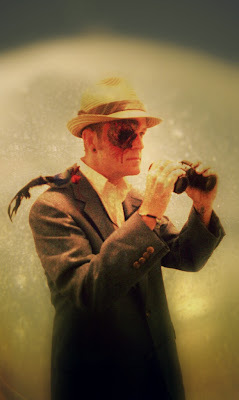 Check out fellow Utah birder, Shyloh Robinson's Halloween Costume...the bird on his shoulder having eaten out the birder's eye. 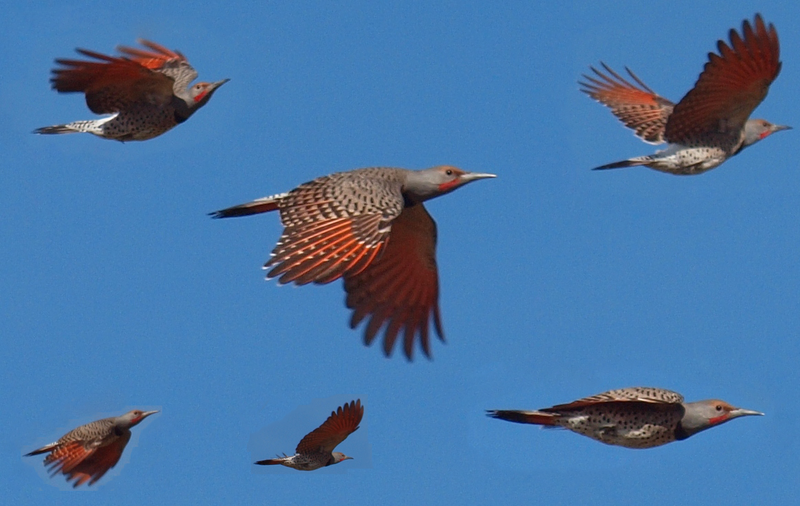 One of my favorite birds to see in flight is the Red-shafted Northern Flicker. I've been trying for months to capture their in-flight beauty. Luckily, I was able to get some half-decent flicker photos at my lunch hour birding patch recently. I took the pictures and made the fun composite image shown above...a la Crossley ID Guide. The primary flight feathers show an awesome shade of orange both on top and from below. Check out the cool spotted belly and flanks and the strong woodpecker bill. It sports a lovely crimson mustache and a black chest plate. The only photos I'm missing now are of the brilliant white rump patch. 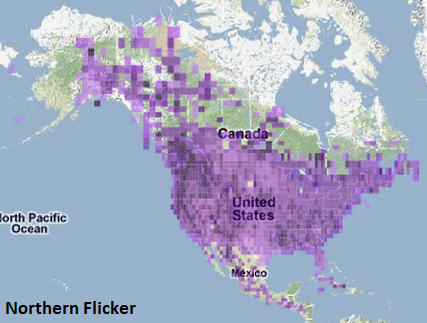 This first map shows everything reported to eBird as a Northern Flicker - pretty solid coverage of North and Central America. 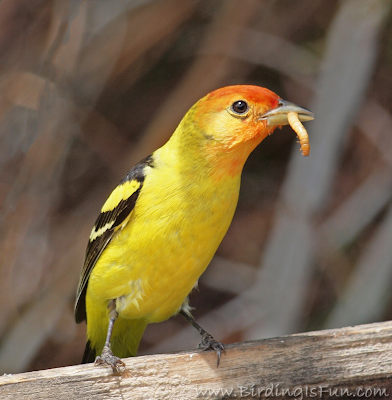 The Yellow-shafted Northern Flicker is commonly understood as being that eastern flicker, but the west coast seems to get many of them, all the way up into Alaska. 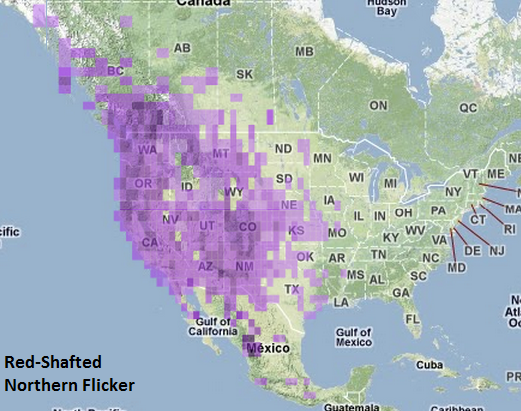 What I find interesting is the absence of reports of Yellow-shafted Northern Flickers in Mexico and Central America. There are other subspecies of Northern Flicker found in Central America, but wow!...no reports of Yellow-shafted south of the U.S. border?! Red-shafted Northern Flickers don't seem to comply with any immigration laws. What I find interesting is that eastern North America doesn't even show any reports of vagrant Red-shafted Northern Flickers. 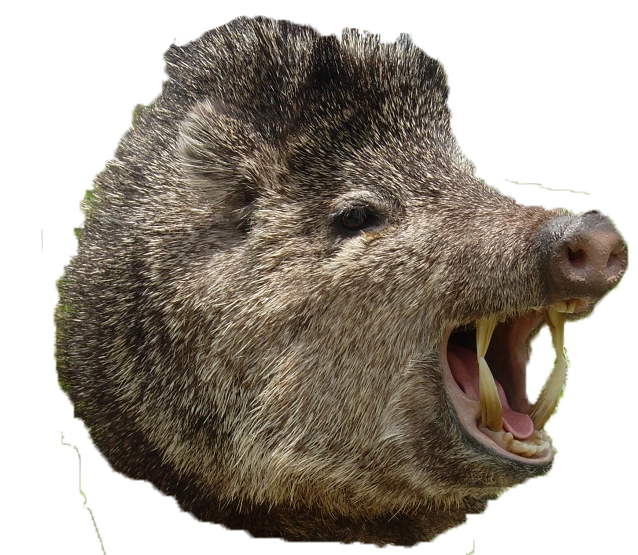 They also only make it down to southern Mexico, and not into the rest of Central America. I understand, due to comments on previous blog posts, that Northern Flicker Intergrades are more common in the great plains of North America than either of the "pure" subspecies. Is that the same for you folks on the west coast? 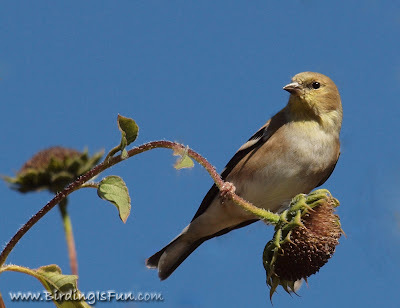 Fascinating information gathered by eBirders like me and you! 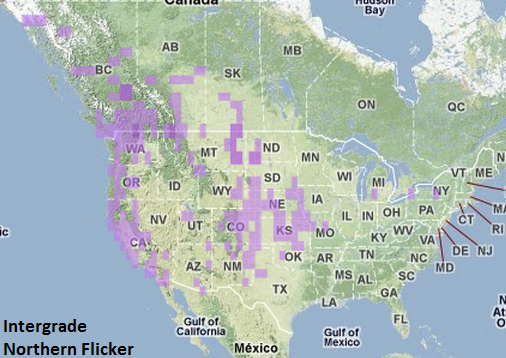 Make sure to give all of those Flickers out there a second look and report them in eBird by subspecies if you can. The Big Year screenplay writer Howard Franklin and director David Frankel have done the sport and pastime of birding a huge favor by providing us with the character of Kenny Bostick, perhaps the best example yet of someone suffering from an obsessive compulsive birding disorder. In fact, so that we don't have to point to real living people as examples of this disorder, I think it is fitting to now call that disorder Bostick Syndrome. Bostick Syndrome (formerly obsessive compulsive birding disorder) may be characterized by a compulsion to bird despite the harmful consequences to their individual health, mental state, or social life. The causes of this syndrome remain to be determined. Contributing genetic or life history factors are currently unknown. There is also currently no known treatment for this syndrome, and the current prognosis for anyone diagnosed with Bostick Syndrome is not good--as it is frequently fatal to marriages, careers, and other respectable middle-class American lifestyle expectations. 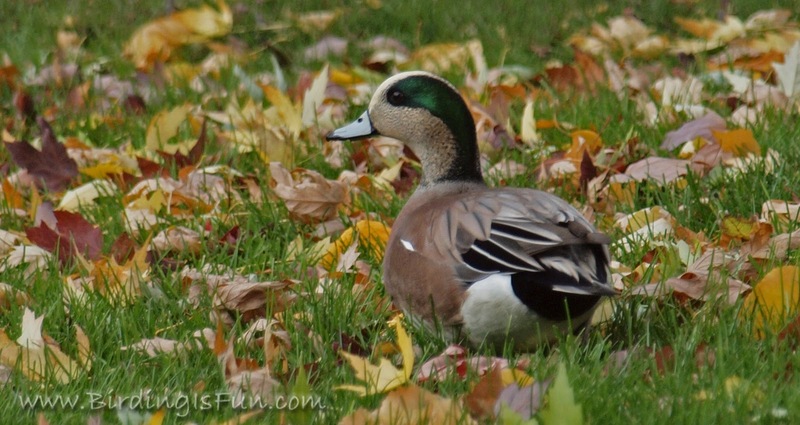 This foray into the multi-author blogging world at the beginning of October had me as nervous as a Gadwall during duck-hunting season, yet as excited as a male Song Sparrow during mating season. 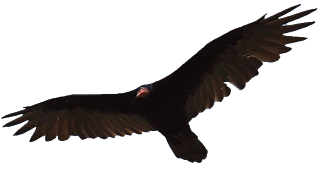 I wondered, "Is the birding-blogosphere already saturated with multi-author blogs?" There are so many online choices to steal away our attention, but I figured that just maybe there was still enough room for one more central location where one could find excellent quality bird-blogging. I have just been delighted with the quality of posts that this team has delivered this month...wonderful and engaging writing and fabulous bird photography. I express my profound gratitude to the BiF! Contributors. You guys are awesome! Thank you dear readers for continually coming back to "Birding is Fun!" and sharing our joy of birds and birding. Thanks to all of you who share our posts in the various social network venues! Because of you, earlier this week BiF! broke into the FatBirder Top 50 and the Nature Blog Network "Birds" Top 10. 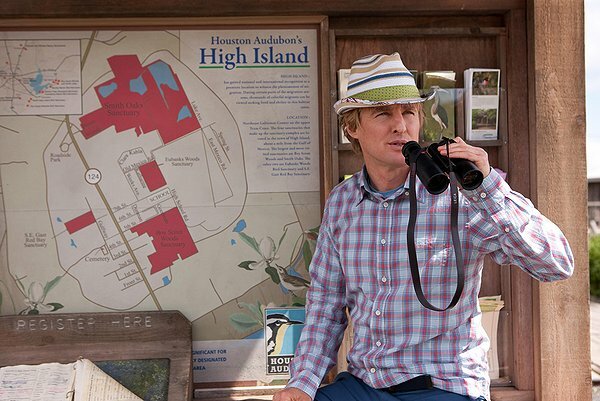 "Birding is Fun!" will only get better from here, so please stay tuned! 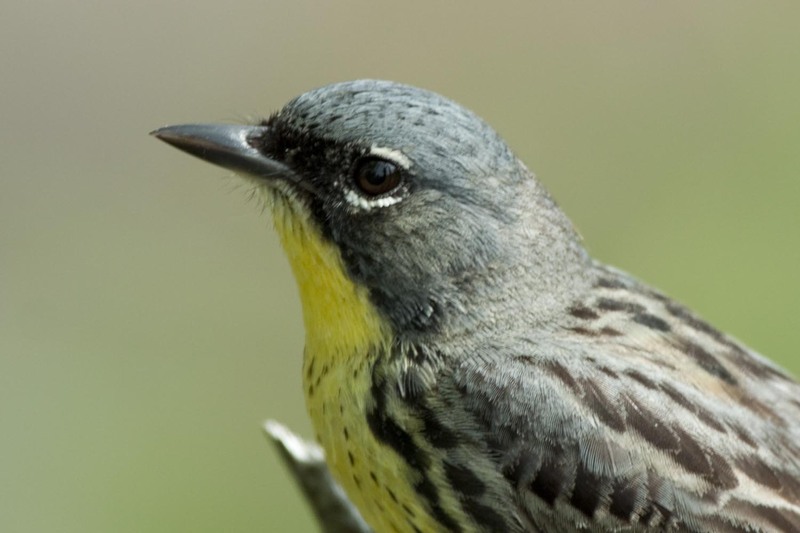 Greg Miller - Who's the Best Birder in the World? Pat Bumstead - Hmm. Uhh. Wha? 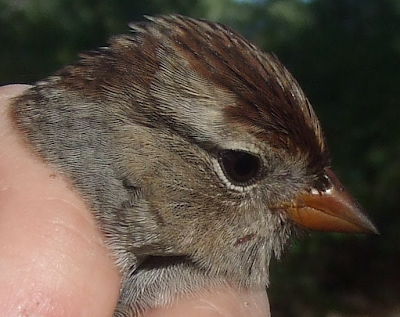 David Sibley - Does technology make birders lazy? Greg Neise - Do they get it? J. Drew Lanham - Birding while Black -- Does it really matter? 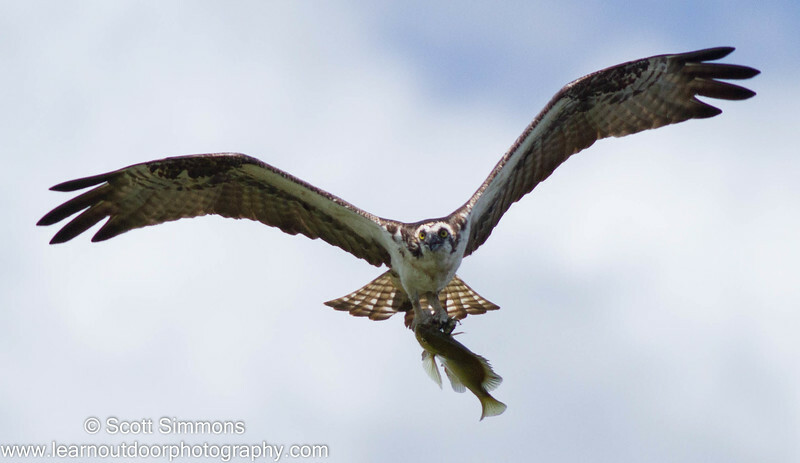 Since this is my first post for Birding is Fun, I thought I'd use this first post to introduce myself and my passion for birding and bird photography. I've been fascinated with birds as long as I can remember. I remember distinctly, when I was only about 5 years old, seeing a roadrunner from our car in Arizona. It was mesmerizing to see. 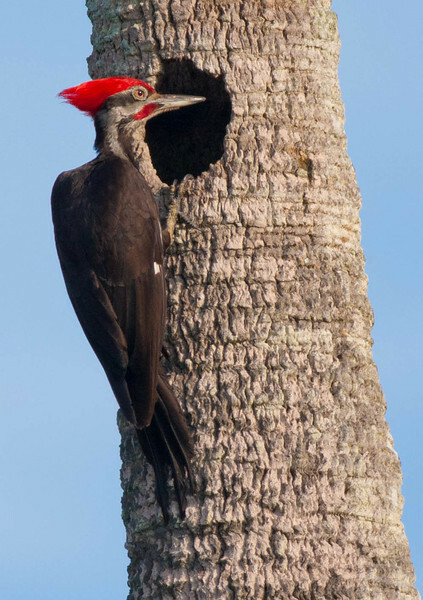 A few years later when we lived in Virginia, I learned about Pileated Woodpeckers, and I just had to see one. 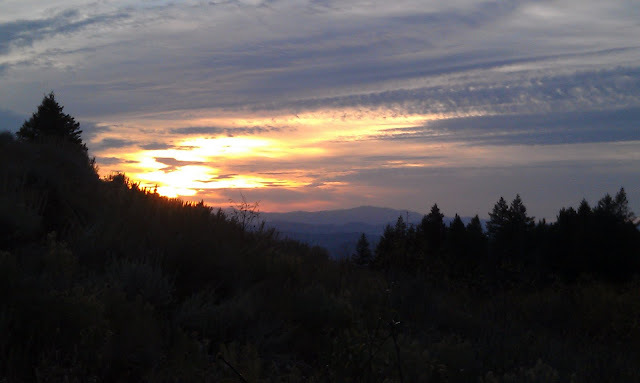 I remember walking through the woods near where we lived determined not to finish my hike until I saw one, and I remember the joy I felt when I did. At that time, I went birding simply for the joy of it. I had no goals, no hopes of seeing a certain number of species in a year, and no plan to find birds that weren't yet on my list. 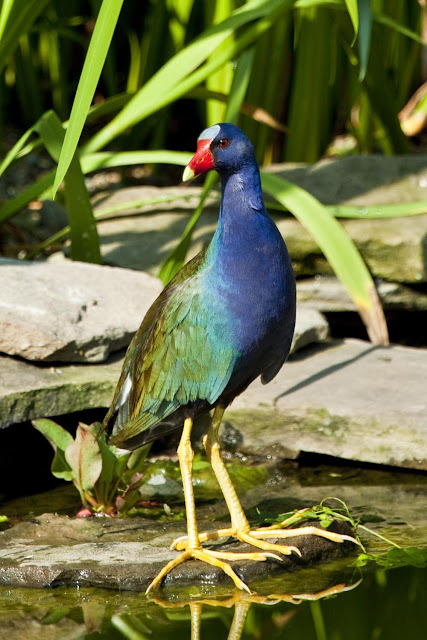 I just enjoyed birds, their beauty and their behavior, and I went birding with my father simply to enjoy nature. Over the last 3 years or so, all that has changed. I have devoted myself to learning about birds and birding; I now read books on the subject, both to allow me identify birds more reliably and to help me find more them. I now have goals to see a certain number of species before the end of the calendar year. 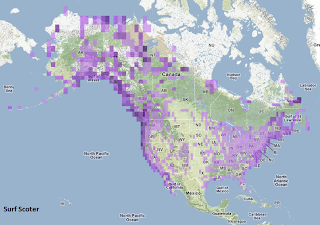 I log every species I see on eBird so that my hobby can benefit the Cornell Lab of Ornithology. I'm dedicated to birding, and most of my non-birding friends think I'm a little weird because of it. 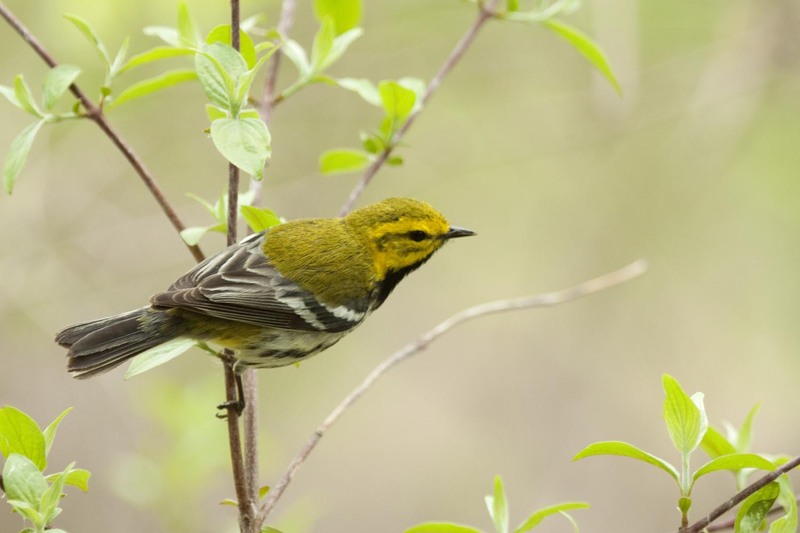 I believe strongly that these are valuable practices that can improve your joy of birding by allowing you to have a better experience of more birds and also contribute to science and conservation. But I often have to remind myself of that day when was mesmerized by the roadrunner in Arizona--my hands and nose pressed against the window glass determined to soak up the sight of the roadrunner running near our car, wondering if there might be a coyote near by. At that moment, birding was not about numbers--it was about the beauty of nature and the opportunity I had to soak it all in. This past Saturday I went birding with my son. We went to Orlando Wetlands Park near where I live. My son isn't a birder like me--at least not yet. He was more interested in looking for alligators and throwing rocks into fire ant mounds to watch the ants swarm around the rocks. He walked ahead of me and scared off a couple good photo opportunities. I didn't see one bird I hadn't seen a hundred times before, but it was a great day. I was out in nature with my son like my dad had taken me out into nature when I was his age. And it wasn't about the numbers; it was about experiencing nature simply for the joy of it. No pressure. That’s how I approached this wonderful opportunity when Robert asked me to write for his blog. Sure I’m the only Canadian on his list, and it’s a big country up here, but no pressure. However, I wouldn’t be much of a bird watcher if I didn’t like a challenge. I’m very flattered to be writing for this blog, and looking forward to seeing what comes out of my pen. Imagine my surprise when my first post turned out to be about a non-birder. My husband of many years does not consider himself a bird watcher. To him, a duck is a duck, unless of course it's larger, then a goose is a goose. 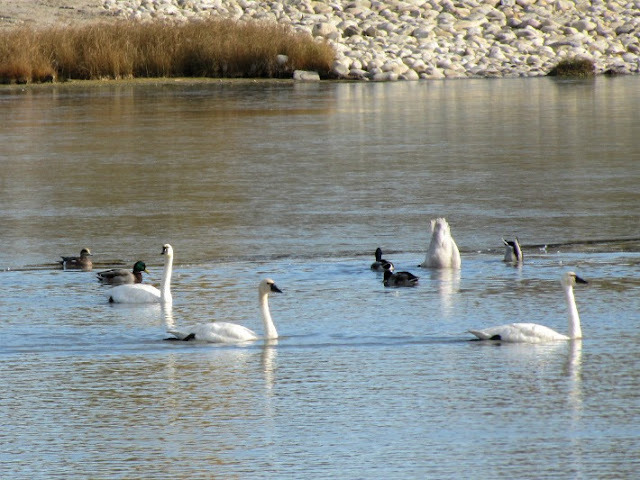 Thus are all grebes, coots, mergansers and other waterfowl except swans (they’re white), neatly categorized. He can however, identify the birds that visit our yard, including female brown-headed cowbirds that flit through occasionally. 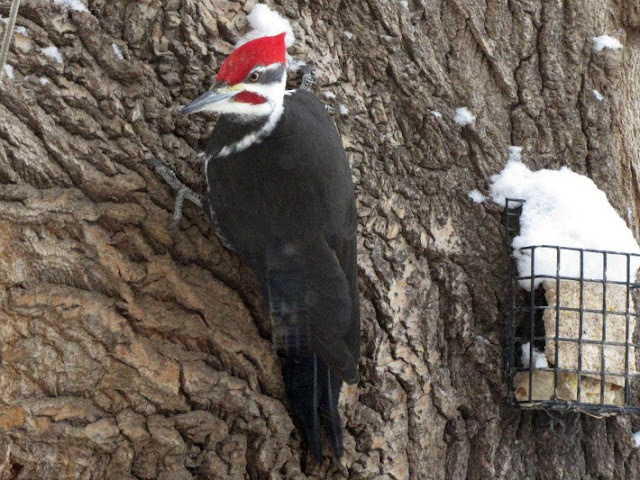 He can point out the differences between a downy and a hairy woodpecker. He knows enough to yell CAMERA at top volume when an unusual bird is at our feeders. 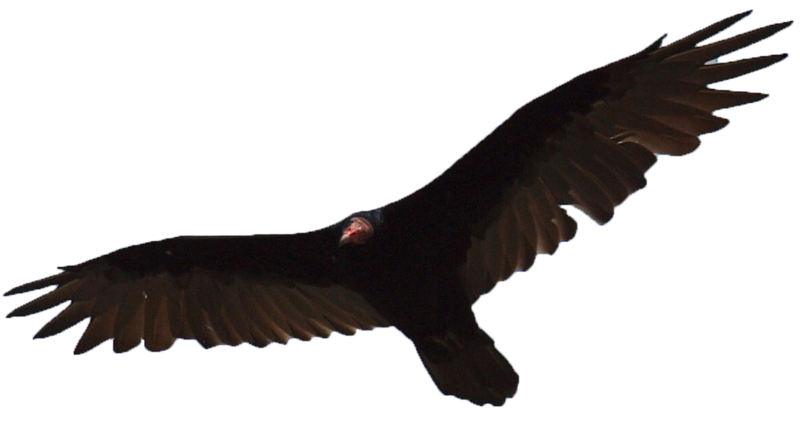 He came home from the golf course one evening very excited because he had 'gotten an eagle'. My birding brain kicked in first, and I was trying to figure out how someone could hit one of the bald eagles on the course with a golf ball. He was unimpressed by my lack of congratulations, but by the time my non-birding brain woke up, the moment had passed. He never even thought of the connection. On a recent fishing trip, all he came home with was pictures. When we're travelling, one of us is always looking for birds while the other one is just enjoying the drive. Occasionally though, the vehicle comes to a sudden halt while I’m gazing out the window, off in bird land. One blisteringly hot day last summer, we were driving slowly along a gravel road as I was looking at a large flock of shorebirds. Suddenly the pedal hit the mat, and I whipped my head around. This is what my non-birding husband hit the brakes for. 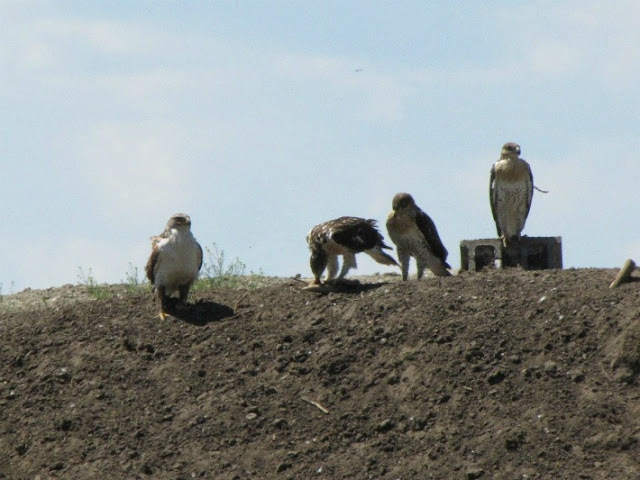 About a hundred yards from the road were five - count 'em - five ferruginous hawks. 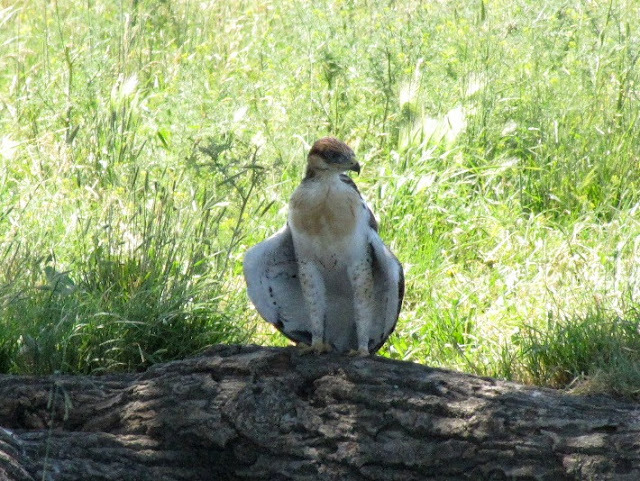 Most birders are overjoyed to see just one of these threatened raptors, and we had five. Once I commented on how rare a sighting that was (okay, maybe I said it more than once). He managed to bring it up in any number of conversations, even with non-birding folks. Does a person have to be interested in all birds to be a birder? Can he retain his 'a duck is a duck' mantra and still think birding is fun? Don't even get me started on what he calls the various gull species, although by now he probably just uses the 'S' word to see the steam come out of my years. 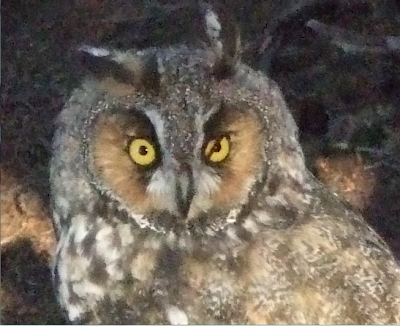 On the other hand, he's very proud of the fact that he's seen nine owl species and has become rather adept at working that into conversations as well. He may deny it, but I'm inclined to think he’s a birder and just hasn't realized it yet. If he ever points out a horned-grebe on the water though, I’ll buy him his own birding hat and pass the salt. 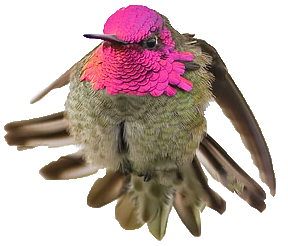 As I normally write for my blog at Bird Canada, I should add that my posts here may sometimes stray over into Canadian-ese. I apologize in advance for all those extra ‘U’s’ that might show up. WeLoveBirds.org is hosting another bird photo contest and I invite you to participate. I'm trying to decide which photo to enter myself. Below are four photos that I am trying to choose between and maybe you can help me. Please tell me which is your favorite of these photos in the little poll in the right sidebar. (click on the photo to enlarge) Thanks! 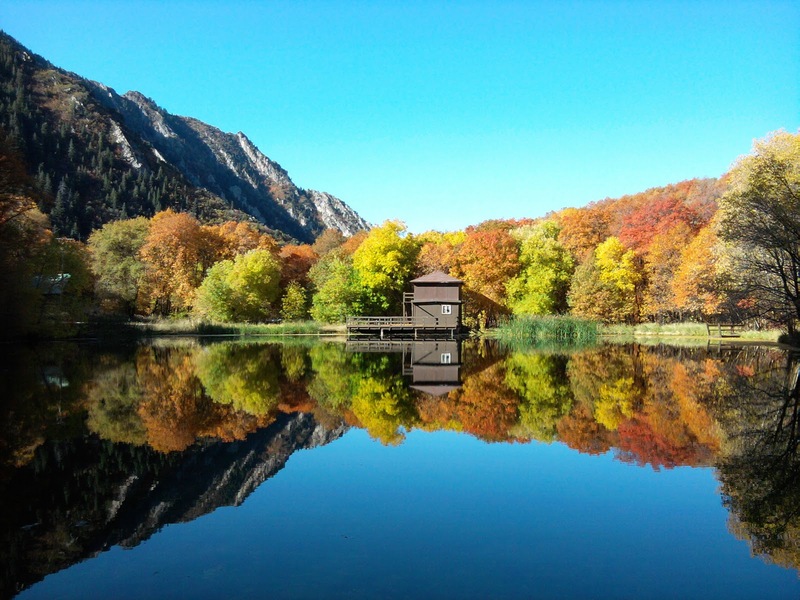 The last two weekends I spent at Camp Tracy in Millcreek Canyon outside of Salt Lake City. I was there for Wood Badge, adult leader training for the Boy Scouts of America. The setting this time of year was about as fantastic as it ever can be. A Belted Kingfisher watched over this canoeing pond. American Dippers called and zipped up and down the creek alongside which we camped. The mornings were crisp and invigorating and the evenings had just that perfect amount of chill to make the campfire all the more inviting. This photo was taken with my cell phone and turned out much better than I expected. Recently at my lunch hour birding patch, the birds were few and far between, but I came upon of pair of garter snakes. Check out that forked tongue! Oh, I did see the usual dozen or so Black-billed Magpies and caught this one in flight. Whenever I hear Magpies makin' a ruckus, I enjoy going to the effort to find out why. Today's disturbance was a pretty house cat up in a Russian Olive tree. Now that I've been trying to photograph birds for a year and half, I have a whole new cadre of nemesis birds...photo-nemesis birds. Nate Swick recently discussed SSV's (Soul Satisfying Views). Might we add, SSP's (Soul Satisfying Photographs)? The Spotted Towhee has presented me numerous photography opportunities, but I have yet to get one of those stellar photos. My best photo to date is shown to the right in heavy shade. 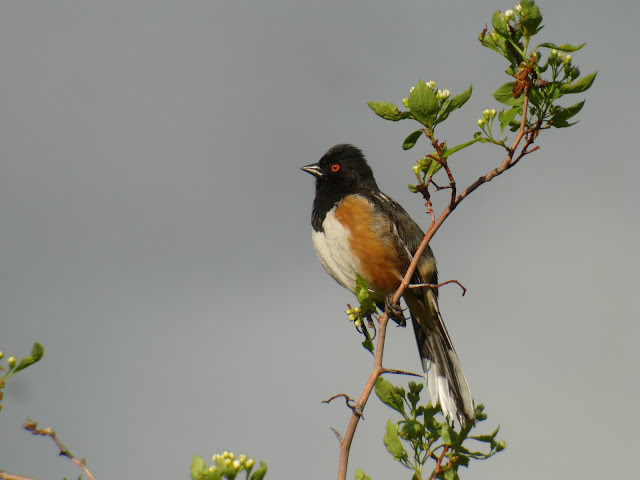 Fortunately, some of my Idaho birding friends shared some great Spotted Towhee photos in the May 2010 photo competition which was hosted on this website. 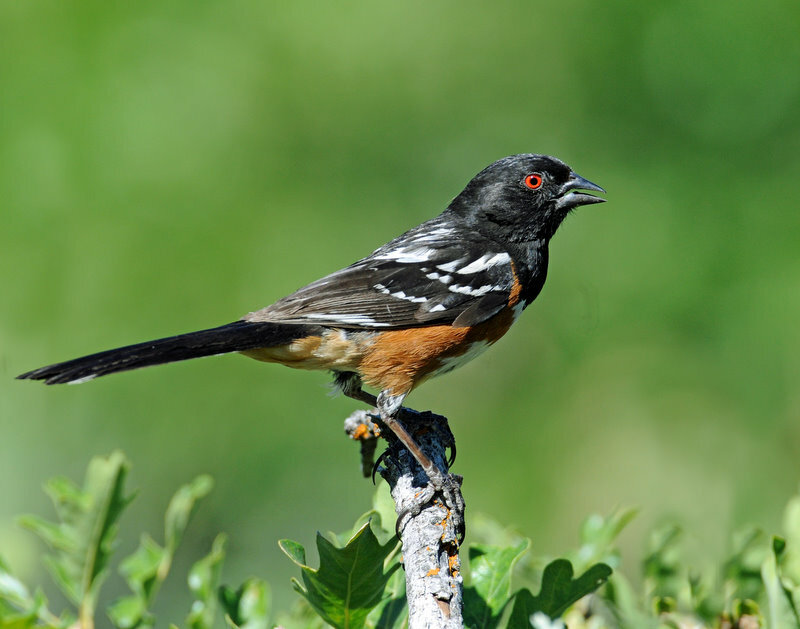 Utah bird photographer Paul Higgins has some fantastic Spotted Towhee photos too. See some quality and SSP's below! My first observation as a birder of the gorgeous Spotted Towhee occurred the day before Thanksgiving in 2006 at Boyce Thompson Arboretum. My birder father-in-law had come down from Idaho to Arizona that week join me in some birding and to feast upon another large domestic bird. Under a tree, there was a handsome Spotted Towhee scratching in the leaf litter. Since that day, I've seen one or more Spotted Towhees on about seventy occasions. 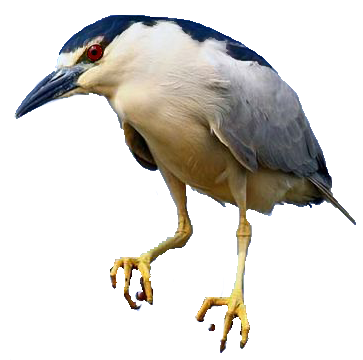 Yet, this bird is one that I can never get enough of. Their behavior is just elusive enough that whenever you see one, you feel like you've accomplished something. Oh, that fiery red eye! The fantastic black and white contrast and the endearing warm rufous flanks. Their songs and calls are easily recognizable...a sweet trilly song...and a wheezy-screechy call. 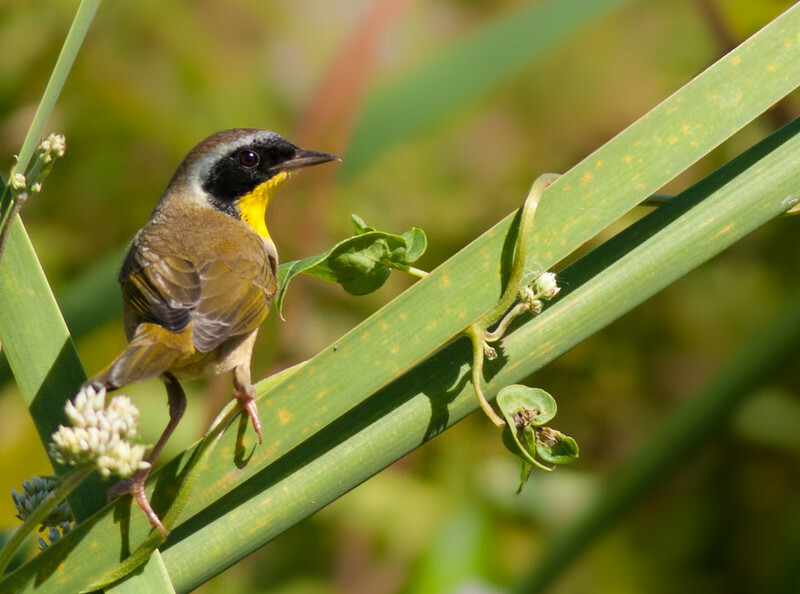 In Spring, the males are more likely to get up on top of a bush and sing their hearts out. That's when I'll have to try again for some quality photos. 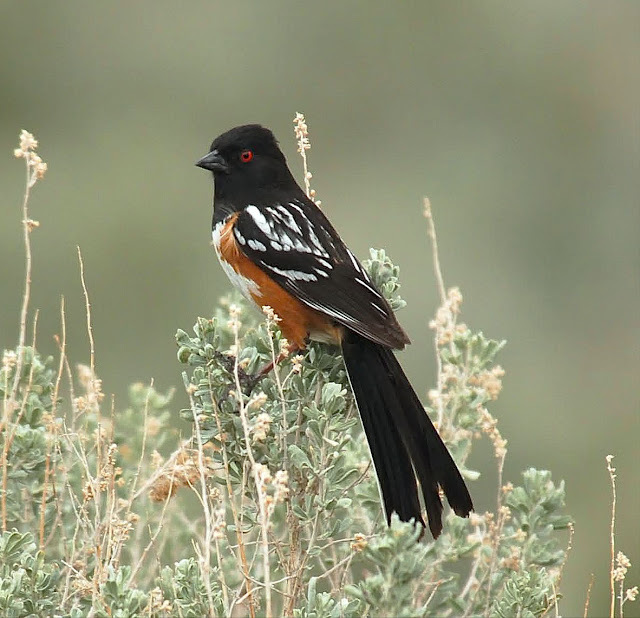 I have found Spotted Towhees throughout all of the seasons in Arizona, Utah, and Idaho. The range map below shows some summer migration into the northern great plains region, which is confirmed by eBird sightings maps broken down by season. 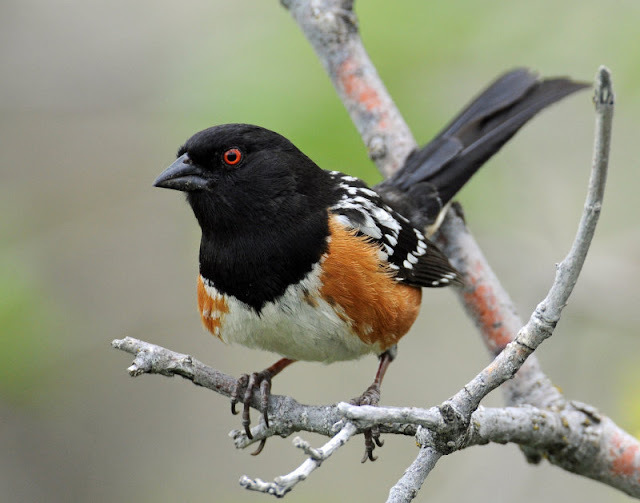 Spotted Towhees are typically a western North America species, but are known to occasionally show up as in the eastern states during Spring and Fall migration. There are also a few subspecies, but I haven't taken the time to learn them yet. 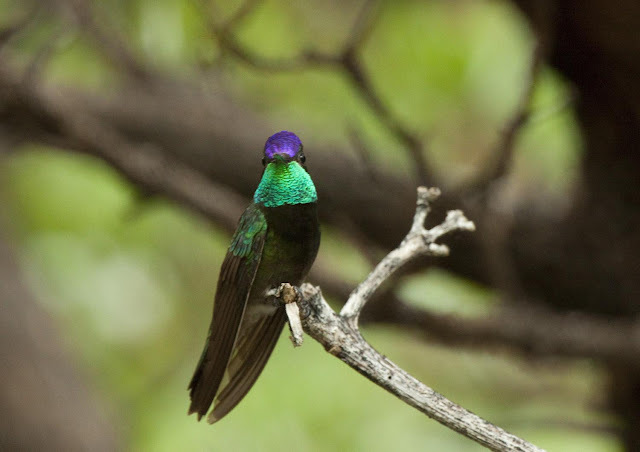 Now if I could just get a quality photo of another of my photo-nemeses - their green-tailed and rufous-capped cousin!!! Green-tailed Towhee that continues to elude the focus on my camera. 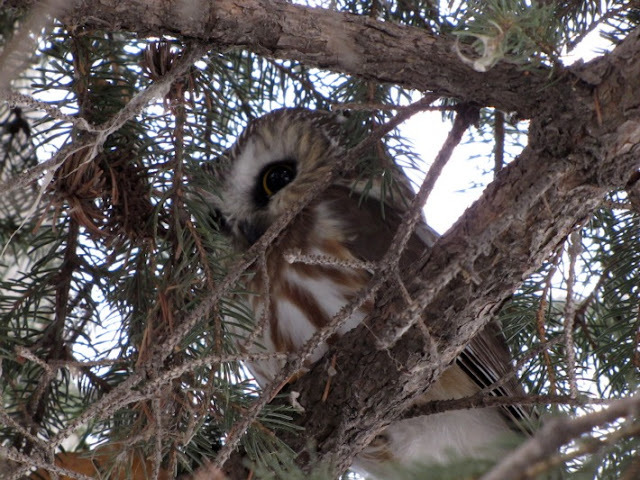 This was taken at my lunch hour birding patch. 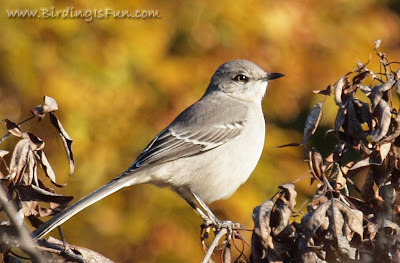 With this being my first post on BirdingIsFun.com, I would like to thank Robert for bringing this awesome group of birders together to collaborate on this blog! I think we are all going to have a great time. I thought I would start by sharing the story of how I got into birding and why it’s now just about all I think about! I started seriously birding ten years ago when I was 16, but I had been unwillingly birding for years before that. For as long as I can remember, my mom had feeders up at our house. She would always point out the usual backyard birds, so I knew most of those from an early age. Sometime in 1993, my mom went out birding for the first time. I didn’t really think much of it back then, but it has come to have an enormous effect on my life. Shortly after, my younger brother, Eric, decided that he wanted to go birding with her. He took an immediate liking to it and began studying birds pretty much nonstop. That was the point at which the amount of time I would spend birding would increase whether I liked it or not. I didn’t have to go out birding with them around home but on family vacations, I didn’t have much of a choice. 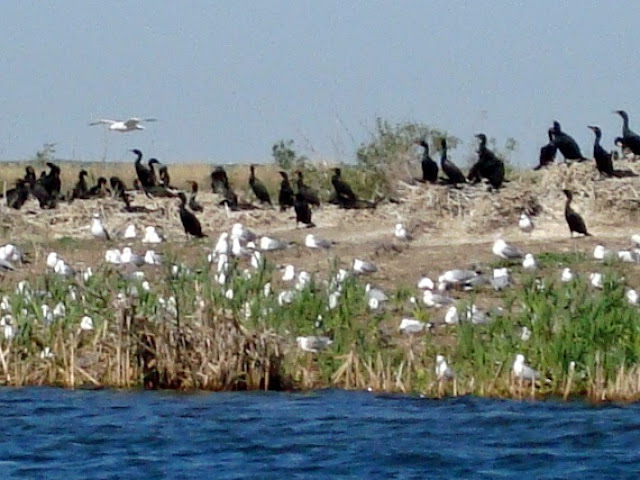 One of the first vacations that my family birded on was to Arizona. I never expected to do so much birding on a single family vacation. 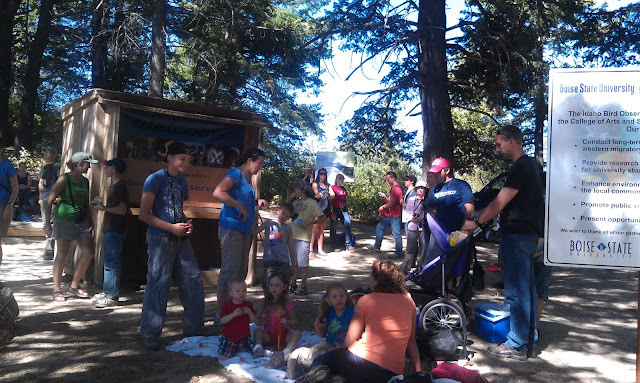 We started in the Tucson area and took a day trip to Sierra Vista. 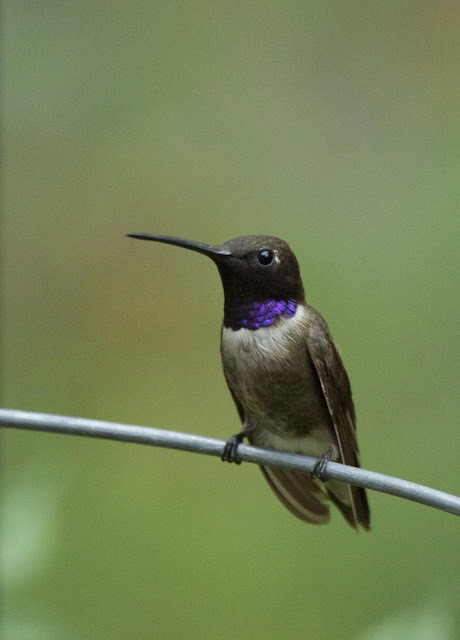 While the hummingbirds, coati, and scenery were pretty cool at Ramsey Canyon, I was generally unimpressed with birding and couldn’t understand how looking at birds and studying them was even remotely interesting. Our next stop was the Grand Canyon. All Eric wanted to do was start birding at the crack of dawn. I thought he was nuts! I had absolutely no interest in doing that and am now sure that I missed some pretty good birds by not going out birding with him. 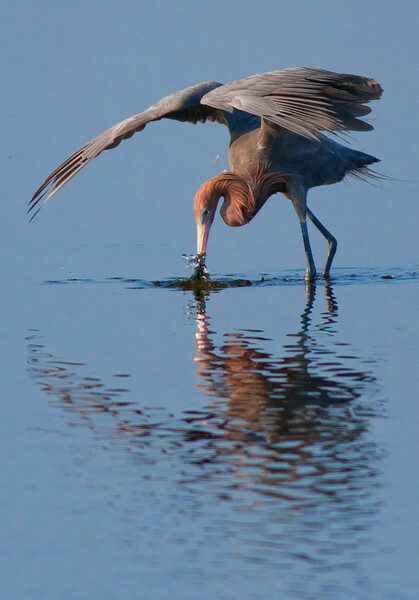 Growing up, I also missed out on tons of great birding opportunities in southwest Florida. My family took annual trips to the Fort Myers Beach area, and for the first few years I had no interest in birds and birding. Fortunately, the repeated trips to the area slowly started to turn me into a birder. 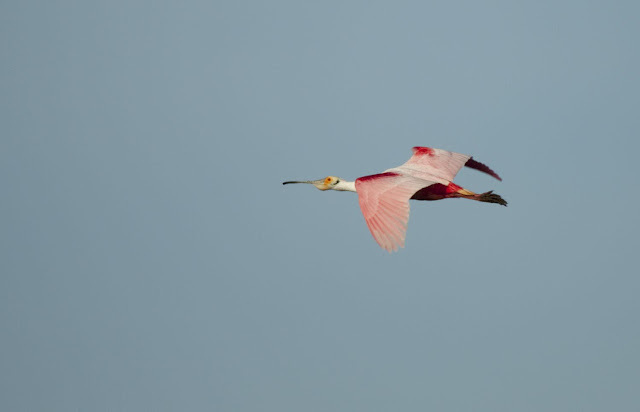 I eventually become fascinated by the large wading birds, especially Roseate Spoonbills! Those family trips in Florida were definitely my first days as a real birder and the first time I ever had an interest in starting to keep a life list. Over the next few years, I continued to bird every once in awhile, mainly on Christmas and Spring Bird Counts, but at that time I never birded on a regular basis. That all changed with a visit to the most amazing spring migration location anywhere, Magee Marsh! 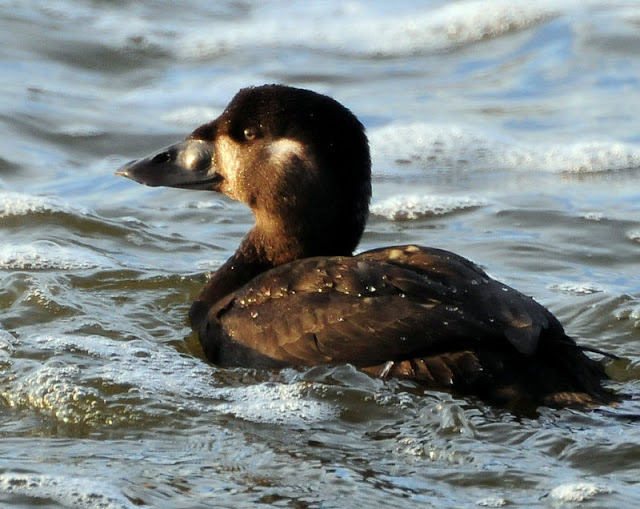 For quite a few years, my mom and brother had been telling me about Magee, but I was a teenage boy and had way too much on my busy schedule to actually make time for birding. After my freshman year in college, I headed up to northwest Ohio with my mom, brother, and some of their birding friends. Little did I know, my life would never be quite the same. It was at that point that I completely fell in love with birding. 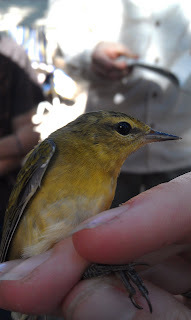 I had never before had such amazing views of warblers, vireos, and thrushes. I was quite simply amazed! The rest as they say is history. I have travelled all over the United States since that time and luckily for me, have made up for the all of the birds I missed in Arizona. I work for Wild Birds Unlimited, speak to kids at schools and camps about birds and birding, serve as Vice President of the Indiana Audubon Society, and run a birding blog and website called NuttyBirder.com. Quite simply, birding is one of the most important things in my life. I look forward to sharing all of my birding adventures here on BirdingisFun.com!